Keen Clean provides cheap end of tenancy cleaning services in London for tenants, landlords and estate agents, with prices starting as low as £83. If you want to get your property in good shape for letting out, or you’re a tenant looking to get your security deposit back, get in touch with us. If you’re in a hurry and looking for a last-minute service, don’t worry – we can take your booking the same day. Get your instant free quote now by calling 020 7101 4325.! *Please note that carpet cleaning is not included in our standard list of end of tenancy cleaning tasks! **You may want to add hot water extraction carpet cleaning. Get up to 25% off when you order two or more services together. ***Please note that we do not wash or clean painted walls and exterior of the property such as balconies, gardens and garages, exterior windows cleaning. Please confirm if you require any of those cleanings. Q: How do you guarantee that professional full house cleaning will restore the property to the standards you boast? A: Our end of lease cleaning team follows thorough agency-approved checklists when working at your rental property. These checklists ensure that every spot in the property will be brought up to the highest standard possible before you relocate. This way, Keen Clean make sure that you will receive your security deposit back. Q: What are the End of Tenancy cleaners work hours? A: You can make the booking at any time. However, you should take in mind that the earliest hour the technicians can start the end of tenancy cleaning is 7:00 am. The latest hour the cleaners can start is around 5:00 pm. A: In order to get the best cleaning results, please defrost your fridge and freezer at least 24 hours before the service. If your appliance hasn’t been turned off before our move-out cleaners arrive, they might not be able to clean it to the highest standard. A: These are the only additional expenses that may be charged for your end of lease cleaning service. Our technicians will always try to find a parking spot free of charge, but if there is nothing suitable available, you will be asked to cover the cost of parking for the time the technicians spend cleaning the property. If your rental property is within the Congestion Charge zone, you will be required to cover these charges too. To avoid this extra payment, consider booking the service over the weekend or on a Bank Holiday, when the congestion fees in London do not apply. A: Yes we can do that, but exterior window washing is not included in the end of tenancy cleaning service. If you want to add exterior window cleaning it will be calculated as a separate service, and you’ll benefit from a discount for booking combined Keen Clean services. A: We only require deposits for bookings worth more than £400. In some cases, we might ask for a customer’s card details, but only in order to secure the appointment on our schedule. Usually, payment is settled upon completion of the job and after the final inspection of the work done at your rental property. Q: Do you provide all the cleaning materials and equipment? A: Our move-out cleaning technicians will bring all the products and equipment necessary for the completion of each cleaning task. A: The end of tenancy cleaning service can require anything from one to six professional cleaners, depending on the size of the rental property. We will send as many technicians as needed for the timely completion of each individual job. A: All carpets and upholstered furniture will be vacuum cleaned. If you want these items cleaned to the highest professional standards, you can add an additional carpet cleaning or upholstery cleaning service with a discount for booking combined services from Keen Clean. Q: How much does it cost to have carpets cleaned too? A: We can provide you deep carpet cleaning service. You can require a professional end of lease carpet cleaning to your booking at a discounted price or book this service alone. You can see the prices for rug and carpet cleaning here. 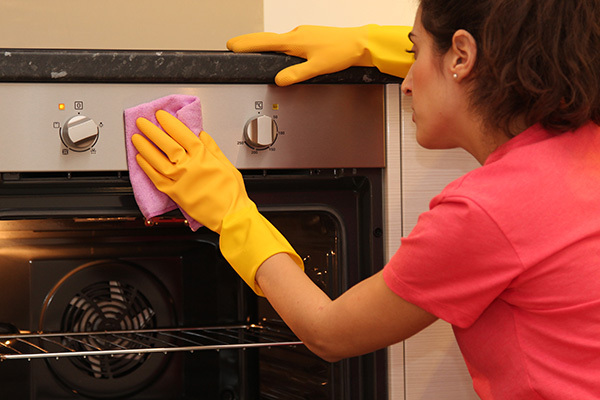 A: Yes, professional oven cleaning is always a part of our end of lease service. The appliance will be disassembled, with all removable parts placed in a container filled with a high-grade cleaning solution that quickly dissolves grease and grime. The oven will be scrubbed and wiped both inside and outside. A: Yes, our move-out team can work while you are away, but you will need to arrange a key pick-up with our technicians. You’ll also need to organise paying for the service with a card. A: The end of lease cleaning service is priced per job, which means that the team will stay on site until the property is in finished condition. End of tenancy cleaning services are not charged by the hour. A: In the unlikely event of our technicians overlooking something during the service, you need only notify us within 72 hours, and we will arrange a second cleaning service. A: You can rest assured that all our professionals are meticulous and careful, so our clients very rarely have to deal with such situations. However, all of our cleaners are fully insured, so you will get fair compensation if any accidents occur. A: In most cases this is not necessary, but it might be required if your property has lots of furniture. To make sure that you will get your deposit money back, our end of lease cleaners will have to vacuum and wipe underneath all heavy furnishings, including wardrobes, sofas, cupboards, etc. A: Yes, our cleaners can wipe or vacuum the blinds as part of the end of tenancy cleaning service. A: es, we can clean these items, but only if they are easy to reach. *Same day service is now available! Our end of tenancy cleaners will provide a good general clean including dusting, vacuuming, cleaning windows and more. Kitchens, bathrooms and bedrooms will be thoroughly cleaned, with no corner left untouched. After we are done, you get our 48-hour cleaning guarantee! End of tenancy cleaning requires a lot of elbow-grease to get the job done just right. But don’t worry – our cleaners are qualified and we guarantee that you will get your security deposit back. We use comprehensive checklists to make sure that no corner is left untouched. Schedule your end of tenancy cleaning by calling us on 020 7101 4325 right away. Our phone lines are open 24/7! Send us a message and we will be in touch as soon as possible.